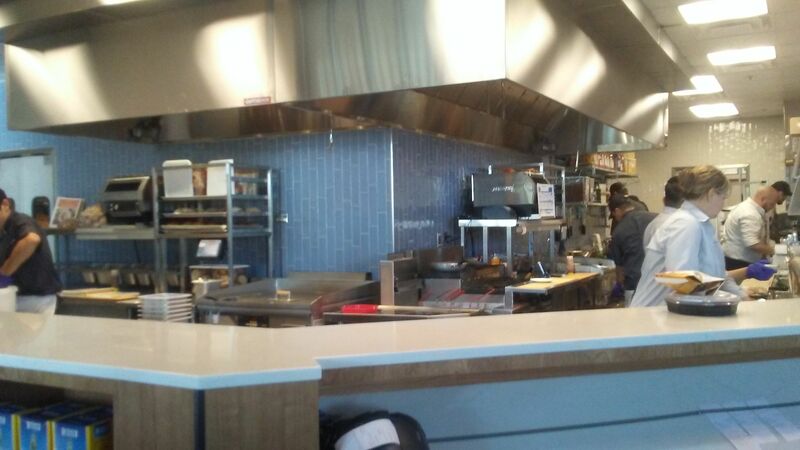 Burning Moon's Inside advice: New Wildflower Bread Location in AZ! 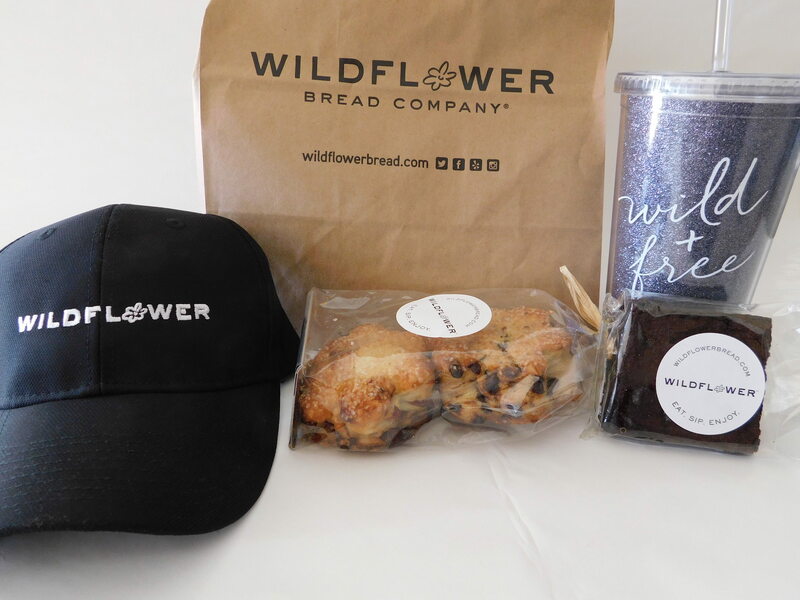 I was recently invited to an opening event for the company Wildflower Bread at their newest location in Gilbert located at 75 East Rivulon Boulevard Suite 101 Gilbert, AZ 85297. It officially opened on Tuesday and is in full operation and ready to offer you a unique environment for a meal. I was invited to a media night to come and see the new location and to try out some of the food, I was pretty excited because I had never been to one of their locations and the food they offer looked appetizing. Wildflower Bread is a bakery and a restaurant, you can come in to sit down and enjoy a meal or you can simply stop by to pick up some freshly baked bread and goodies. Everything is handmade by the company, each loaf generally takes four days to properly make and it shows in the quality of their products. They mix the dough and let it rise at a facility outside of the bakery before they deliver it to the store and bake it fresh in store. This is one of their breakfast items and both my husband and I loved this. It came with toast and potatoes that were seasoned perfectly. I enjoyed the fact that they added salsa and avocado to the top of the frittata it really brought out the flavors of the dish. This is a menu item I would get again on another visit to Wildflower. I am normally not a big seafood fan, I will eat salmon and shrimp from time to time but I generally don't go out of my way to eat fish products nor am I a fan of feta cheese. That being said I absolutely loved this salad! It had a slight fishy taste to it because of the salmon but it all came together rather well. My husband is the one who is more into seafood but oddly enough he didn't really enjoy this salad and didn't finish it, he was surprised I liked it so much and that I finished my portion. I really liked how well the sweet corn, cranberries and sunflower seeds went with the salmon for a balanced salad. Reuben Sandwich - corned beed brisket,caramelized onion,sauerkraut,Swiss cheese & thousand island dressing on Marble Rye bread. This is not a regular menu item, it is seasonal and will appear around St. Patrick's day until early June. 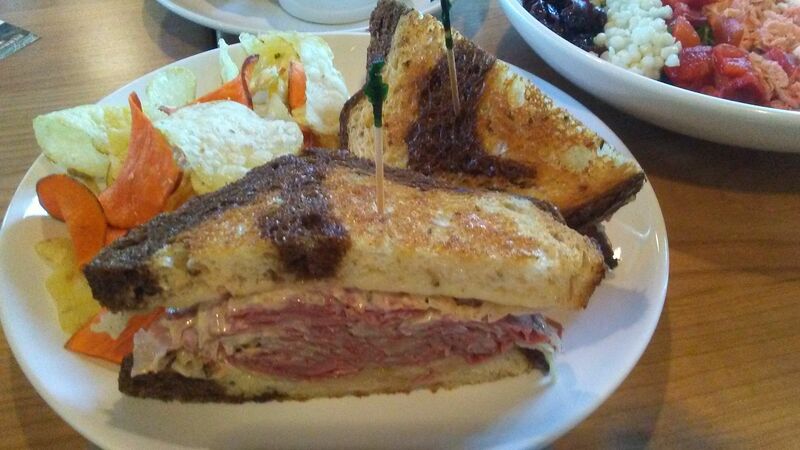 My husband is a huge Reuben fan and this ranks as one of the best Reubens he has tried. The meat was tender and juicy, some corned beef can be a little stringy but this was perfect. The toast was a little well done but that wasn't a big issue, we both loved this sandwich and plan on going back to buy another before it is out for the season. Sadly neither of us were a fan of this salad, not because it wasn't made well but simply because there are several food items in it that we don't like. For my husband he didn't like the amount of eggplant in it and stated he didn't really taste anything but the eggplant. When it came to my dislikes it was the feta, celery and eggplants they aren't things I enjoy eating and I usually tend to avoid them. However if you are a fan of all of these ingredients this salad is jam packed with nutritional goodness and is quite a filling meal. This isn't your typical mac and cheese, it has a bit of a kick to it and is made with thick swirled pasta that is very filling. The three cheese sauce is thick and creamy and with the added handmade bread crumbs on the top it gives it the perfect texture consistency when eating it. This dish comes with a side of yummy garlic bread. They also offer a kid friendly mac and cheese that does not have the peppers. We enjoyed this creamy and delicious pasta dish, unfortunately by this point we were so stuffed we weren't able to fully finish this dish otherwise we would have ate the whole plate. The chicken is cut extremely thin, to the point where I was confused where the chicken was until I realize that the green of the pesto had given the chicken a bit of a green hint. The pasta and chicken mixed with a side of garlic bread was a nice way to finish off a lovely dinning experience. Desserts - For dessert we were able to test out three different treats, we ended up trying them at home though because we had no more room after all the food we tested out. 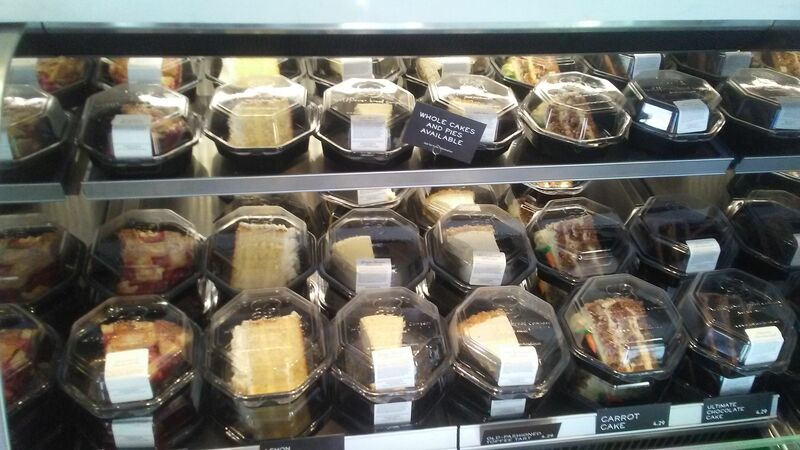 The three desserts we were able to take home was their new sea salt brownie, their carrot cake and cheesecake. My personal favorite was the brownie, the sea salt really brings out the delicious and moist chocolate flavor of the brownie. My husband on the other fan didn't like the salt which meant more brownies for me! Both the carrot cake and cheesecake were moist, didn't have too much or too little sugar and were delicious. The cheesecake reminded me of my great grandmothers cheesecake recipe. Drinks - All of the wine and beer they offer are made and sold by local breweries and vineyards. My husband tested out the wine and highly enjoyed it because it didn't leave a harsh after taste. Wildflower also offers a coffee bar and they have sofa plus different teas and lemonades. My favorite was the Blackberry Orange Lemonade, I have four cups there and I took one home! I think I am love with it and wish I could buy it my the gallon. I really enjoyed Wildflower Bread, it had a very warm and welcoming feel. They take pride in their customers, community and employees and it adds to the atmosphere at each location. We don't go out to eat often but when we do I can see this being a place we stop at often, especially since there is a location just up the street from our home. 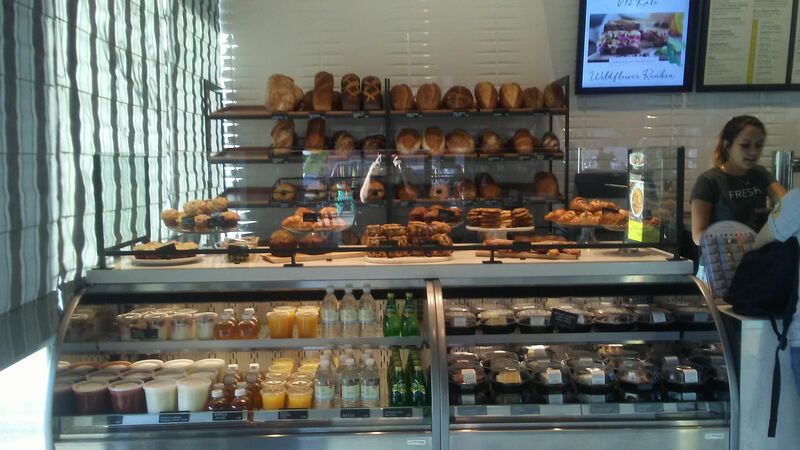 Wildflower Bread has fifteen locations state wide with another opening around June. Before we left we were given a Thank you goodie bag with the goodies you see above. My daughter claimed the hat as hers and we were lucky my husband and I both received bags because both my daughter and myself wanted the cup. Yum! This place sounds and looks delish! That place looks amazing! There are not enough bakeries in the world! With so many little ones I really value how easy they make it to grab something sweet quickly! The Reuben Sandwich looks delicious. I have always loved Corned Beef with Cheese. I hope they make it into a regular menu item. This place looks so good, the reuben is mouth watering. I love wildflower! I wish there was one near me! they have such delicious food!